There are many myths that surround American understandings of Israel, but one of the most difficult to dispel is the fairy tale of Israeli democracy. Earlier this week, Jason Greenblatt, Trump’s advisor on Israel, published an op-ed in The New York Times full of falsifications about who is to blame for the situation in Gaza. Spoiler alert: It’s not Israel. One of his pieces of evidence for why Israel is blameless for the situation in Gaza is the “normal lives” of “Arabs in Israel.” In some cases, “Arab” citizens are even allowed to “thrive,” according to Greenblatt’s analysis. Adalah has documented Israel’s institutional discrimination against its Palestinian citizens for over two decades. In Israel, there is a distinction between citizenship and nationality. Citizenship is Israeli, but citizens are identified by nationality comprised of various ethnic and religious categories, including Jewish, Arab, and Druze. In 2013, the Israeli Supreme Court affirmed that there is no such thing as an "Israeli nationality." Israel tolerates “procedural democracy” by giving Palestinian citizens of Israel the right to vote and participate in political life; however, true democracy requires a foundation of equality and justice. Maintaining a Jewish majority is a critical component of Israel's self-identity as a Jewish and “democratic” state. Israel’s Law of Return, adopted in 1950, grants every Jewish person in the world the right to obtain citizenship and live in Israel; Israel does not, however, recognize the right of return for Palestinian refugees. No where are Israel’s colonial ambitions more clear than in Palestinian access to land. Palestinians citizens of Israel make up 20% of the population and live on less than 3% of the land. Residency in 43% of all towns in Israel is determined by Admissions Committees that filter out Palestinian applicants on the basis of their “social unsuitability." Trump and his Middle East team soon will unveil yet another “peace plan” for the region. Given Trump’s recognition of Jerusalem as Israel’s capital, his relocation of the U.S. Embassy from Tel Aviv to Jerusalem, and his approval of Israel’s annexation of the Golan Heights, Palestinians have no reason to take Trump’s plan seriously. Netanyahu’s campaign promise to annex Jewish settlements in the West Bank is a real threat in this political moment. But Palestinians have an alternative. A future where all people of Palestine/Israel live in freedom, historic justice and equality. We will assert this hopeful vision throughout the course of the Democratic Party primaries and into the Democratic National Committee convention in the summer of 2020. The issue of justice for Palestinians will be a central debate among Democrats and progressives. Adalah Justice Project, through outreach, messaging and action, is ready to shape that conversation. Today, April 17 marks Palestinian Prisoners’ Day, when Palestinians highlight the cases of our family and friends who have been through or are currently held in the Israeli prison system. Imprisonment is an issue that impacts almost all Palestinians inside occupied Palestine and many across the diaspora, including me. I learned about Israel’s prison system at a young age, hearing horror stories from family and friends who endured brutality and torture when they were prisoners. My uncle Ayed, a man I look up to for his humor and kindness, spent time in Israeli prison during the First Intifada. In Israeli detention, he was tortured by Israeli prison guards and sustained life-long injuries. He was subjected to shock treatment to his head and constant beatings while he was on hunger strike. This dark period has impacted his entire life as he carries pain and trauma, both physical and mental. Currently, there are 5,500 Palestinians in Israeli prisons across the occupied West Bank and Israel, including 500 administrative detainees, 200 children and 50 women. Since 1967, Israeli forces have arrested more than 800,000 Palestinians. Almost every Palestinian family of five has had one of its members detained in Israeli prisons. Throwing Palestinians in cages is an Israeli tactic to assert control and serves as a tool of the occupation. Detention of Palestinians is designed to tear down the social fabric of our society. With 99.74% conviction rate of Palestinians in Israeli military courts, imprisonment is meant to break down our spirit. Instead we continue to rise up and call for the freedom of Palestinians prisoners and all Palestinians who live under Israel’s control. Palestinian prisoners are at the center of the Palestinian struggle, for it is the prisoners who are calling for unity among Palestinians and among all freedom loving people around the globe. Their calls for justice and freedom span from Pelican Bay to Palestine. It is our duty to act on their demands and advocate for the freedom of political prisoners everywhere and envision a world without cages. On this Palestinian Prisoners Day, we ask that you take time to learn about the crucial work that our partners at Addameer and Defense for Children International - Palestine are doing to advocate for Palestinian prisoners and their families. We also encourage you take action in your communities by building relationships with local organizers working on the issue of mass incarceration in the United States and transnationally. As we watch the results of yesterday’s Israeli election come in, one thing is clear: racism is not the exclusive domain of any one political party or candidate - it spans the spectrum of almost all the Israeli political system itself. The Israeli elections took place in the shadow of the Jewish Nation-State Law, which constitutionally enshrines Jewish superiority that has existed in the State of Israel since its inception in 1948. The winners may not yet be finally determined, but we know that Palestinians don’t win in a state that defines itself as exclusively for the Jewish people. It is time to build a different vision for the future: one of justice for all. The only tenable progressive vision for the world is one in which all people have freedom, historical justice and equal rights. This is a political opportunity to prevail and thrive collectively. The Nation-State Law is but the latest reminder to our global community of the ever-present choice in situations of injustice: to align with the powerful and entrench inequality or to restore balance by siding with those excluded from power. Securing Palestinian human rights depends not on the cancelling of the Nation-State Law, or enshrining liberal language into Israel’s constitutional code. True freedom and justice for Palestine requires that every individual pursue equality, even and especially when that individual benefits from privilege.It requires that institutions guarantee freedom, even and especially when keeping the Other behind walls or in cages offers a comforting illusion of safety. It is a demand of justice, even and especially when justice requires that every exclusionary frame be dismantled. Such political coherence, rooted in universal values of human rights, will guide the emancipatory process of decolonization and the collective pursuit of historical justice. Adalah Justice Project has teamed up with the US Campaign for Palestinian Rights to shape a progressive vision. Add your name to tell Congress that we want a new political vision that asserts that justice is indivisible! P.S. 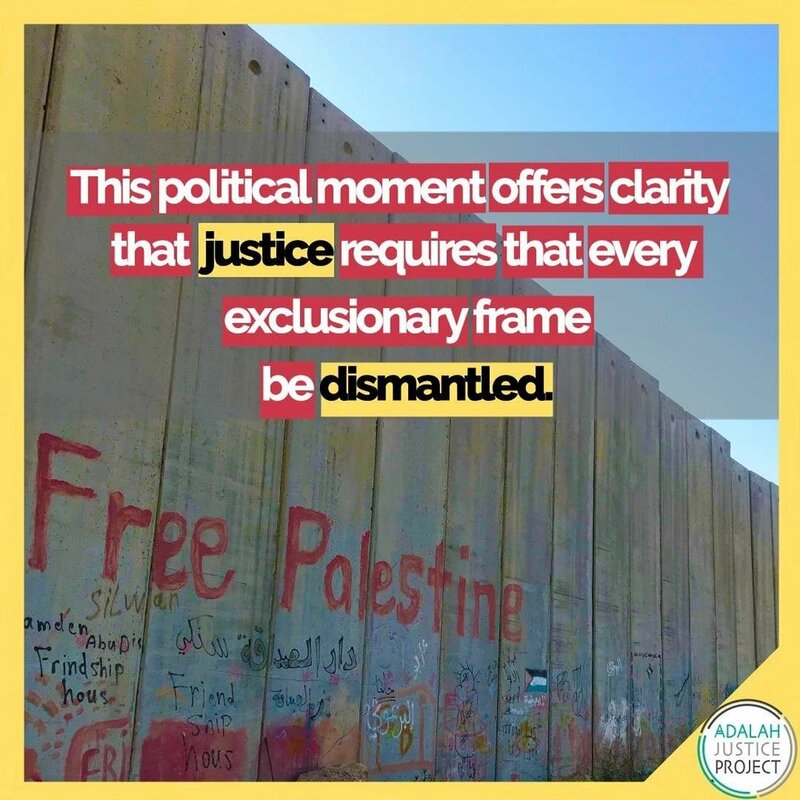 Please consider a monthly or one-time gift to Adalah Justice Project to support our advocacy work and bring more Palestinian voices to the US movement for social justice.